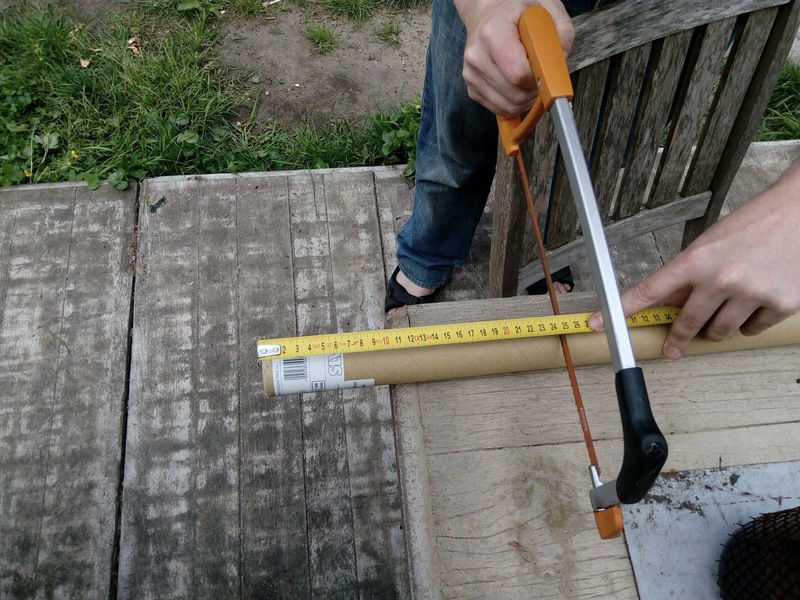 Last weekend we took a first stab at making the solid rocket propellant GALCIT. Long story short: melting bitumen on the temperature controlled hotplate took a lot longer than expected so we weren't able to mix in the potassium perchlorate yet. That's planned for the next session, tomorrow! Below is a small report of the session with some visuals. Lots of gratitude to Peter Madsen of the RML spacelab for providing us with this formula and lots of useful pointers. They are doing amazing work. Also a big thanks to the mentioned suppliers. Each of them went out of their way to guide us to the proper channels for acquiring these products. They seem to be of great quality! 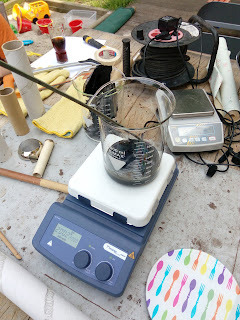 We are making a volume 2l of GALCIT so at the published density of 1.72 kg/l the total propellant mass computes to 3.44 kg. 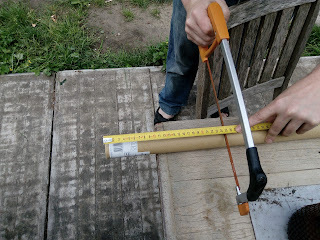 Cutting 688g off of it was difficult, as expected. Bart discovered that cutting it with a long, strong, heated knife turned out to be the easiest way to cut slices off. 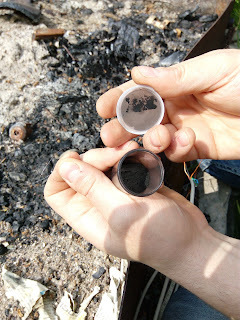 I was surprised to see that although bitumen looks heavy, it actually has a low density. Look at all that volume to make up just 689.28g! To melt the bitumen, we are using the RSM-05-H by Phoenix Instrument. This hot plate with built-in magnetic stirrer can stir 20l of water and reach up to 550 degrees Celsius. Having accurate temperature control is important to avoid overheating the propellant. Overheating is in any case unlikely because of the big difference in preparation temperature (less than 200 degrees C) and combustion temperature (500 degrees C). Melting the bitumen took a lot longer than expected. This is not unusual - bitumen just takes a long time to melt. Also, we did the mixing outside with a light breeze, which is great for ventilation but causes quite some heat loss on the hot plate. 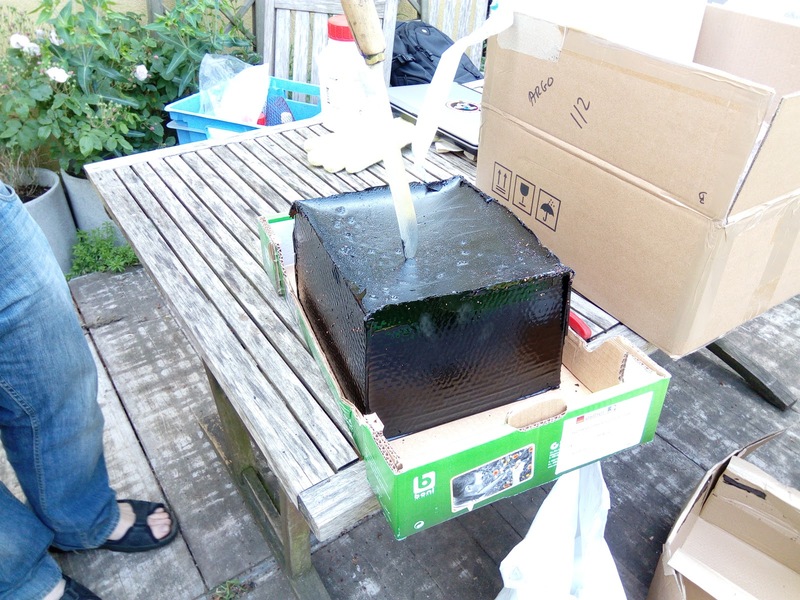 To speed up the melting process, we turned the temperature up to 200 degrees C, which is without risk as long as the oxidizer (the potassium perchlorate) is not mixed in yet. 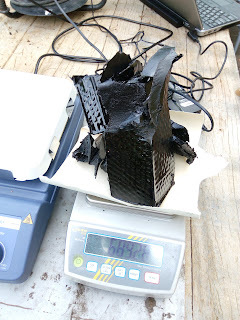 In total, melting 689.28g of bitumen with paraffin oil took around 1 hour and 15 minutes. While melting, we experimented with a small amount of ignition powder, composed of 80% potassium nitrate (KNO3) and 20% fine carbon powder. So next time, we'll add some sulfur to the mix and try to get our hands on an automatic powder mixer.